Fold at Riedberg Pass, Full view. 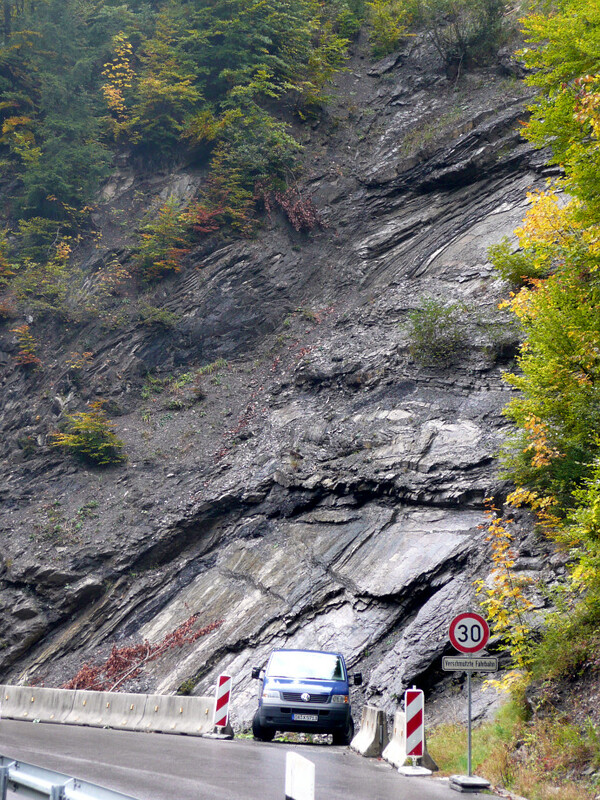 Fold at Riedberg Pass, detail view (left of the traffic sign). Stick measure for scale, length 1 m.
At this outcrop, the Ofterschwang Layers of the Rhenodanubian Flysch are exposed, which consist mainly of mudstones and marlstones from the Albian and Cenomanian. To the north, the Helvtic shelf deposits were formed in the Cretaceous and Paleogene. At the end of the Paleogene, the Flysch nappes thrust over the Helvetic. (Later, the Alpine Limestone („Kalkalpin“) nappes from farther south where thrust over this stack.) 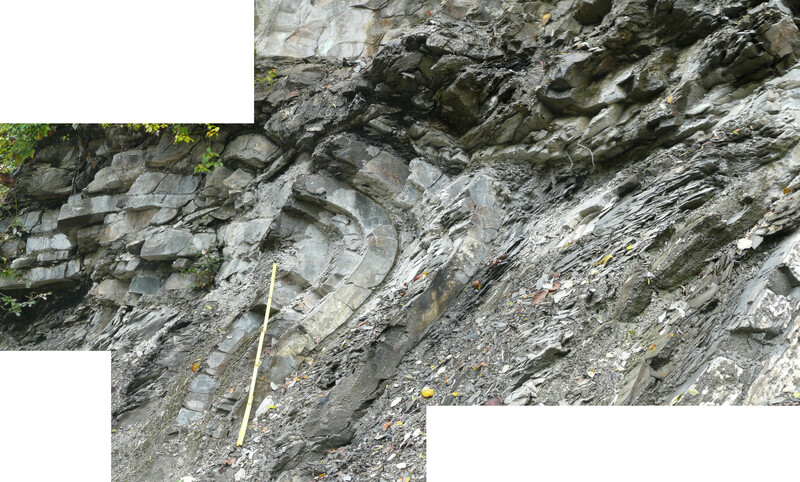 In the process, this north-vergent fold was formed. Geologic map for the fold at the Riedberg Pass (LfU Bayern1, some missing symbols added). fo = Rhenodanubian Flysch: Lower Coloured Marls or Ofterschwang Layers to Anthering Formation – claystones, siltstones, marlstones and sandstones, locally conglomerate, limestone. ff = Feuerstätter Flysch – claystones, siltstones, marlstones and sandstones, locally conglomerate and breccia, with limestone and mafic volcanic rocks. hm = Schrattenkalk (“grykes limestone”) to Garschella Formation – limestone and sandstone, partially marlstone. ho = Seewer Limestone to Hachauer Layers – marlstone and limestone, partially sandstone. 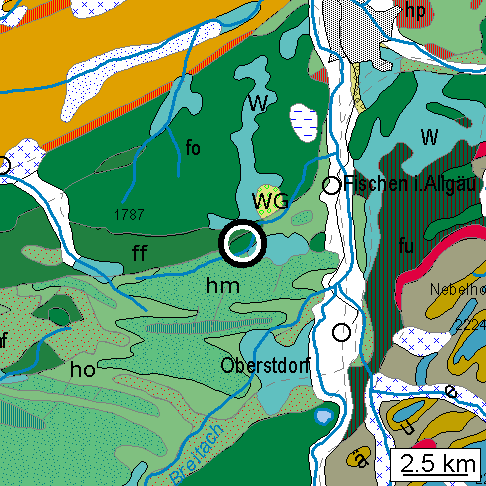 W = Young Moraine (Würm Glacial) with end moraines, partially with glacial-advance outwash deposits – sandy to clayey-silty gravel. WG = Outwashdeposits from the Würm glacial – sandy gravel. The geologic development of the sediments in the surroundings is shown in the table below. North is to the left, south to the right. Vertical bars are the time spans for the sedimentation of the layers (labelled with the symbols from the map above). Block diagram of the Allgäu Alps (from Scholz, 1995). North is left. 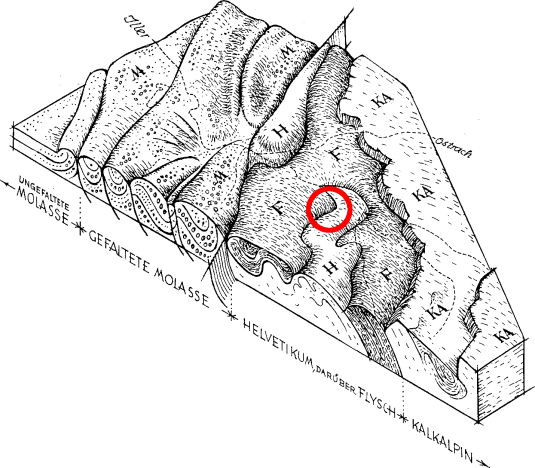 KA = Main alpine limestone, F = Flysch, H = Helvetic (mainly karstic limestone), M = Molasse. In this picture you can see that the clay-/mudstone layers are dipping parallel to the slope. Combine this with the generally quite moist conditions and you'll understand that there's always some repair work to be done somewhere on this road, as it slowly creeps downhill. Slope to the right of the outcrop shown above. If you come from Obermaiselstein (in direction to Balderschwang), you pass a small tunnel, cross the brook Schönberger Ach und reach the first ascent of the pass road. 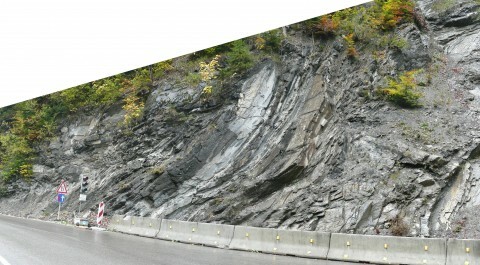 The outcrop lies in a slight left curve. At the outcrop and shortly before, there are two openings in the railing with very short dead-end tracks where you could park a car. On foot, you could go down from the Großer Herrenberg to the pass road which you'll reach by a little bridge over the Schönberger Ach, roughly 300m below the outcrop. Be careful of the traffic; there's no separate pedestrian sidewalk and some people drive like crazy on this road. Scholz, Herbert (1995): Bau und Werden der Allgäuer Landschaft. Schweizerbart. Sehr schön! Eine Frage: Wie stellst du die "Panorama-Aufnahmen" her? Leider habe ich damals etwas zu wenig Fotos gemacht, dann entstehen häßliche Löcher und Ecken. Außerdem ist der Meterstab verrutscht. Idealerweise sollte man beim Fotografieren die Kamera im Nodelpunkt bzw. der Eintrittspupille drehen, um Parallaxenprobleme zu vermeiden. Das hab ich auch erst hinterher erfahren… Im nächsten Sommer mach ich vielleicht mal ein besseres Foto. Hach, wie lange haben wir an diesem Dialog geübt! I have no idea what's going on in the text but the pictures are beautiful! If you wait a few days, I should have finished the English translation. Nice fold! Thanks for pointing to it in the Wedge comments.